Searching for the best toys for 5-year-old girls? Not sure what to look for online, or consider when heading to your department store? These pink aisles on the toy section might first seem overwhelming, but understanding the developmental milestones for 5-year-olds should ease this process. Your child’s personality and areas of interest might be useful as well. We’ve gathered here the information needed to help you select the best toy for your little girl. I’ve then reviewed the best toys available for 5-year-old girls. Use the links above to check the latest prices or read our in-depth toy for 5 year old girl reviews below. Motor: 5-year-old girls should be able to run, jump, and hop. They usually have good balance, and improved coordination (source). They should be able to hold a pen, unzip a sweater or fasten a button. Emotional: They’re now able to express their feelings, what they like and don’t like, and even show empathy. This phase is characterized by extreme emotions. Social: She enjoys spending time with family and making new friends. Being accepted and pleasing friends and parents is important at this age. Language: They can be understood and their vocabulary expands, forming more structured and complex sentences (source). Cognitive: She can copy shapes, count up to 10 objects, plus her drawing skills will improve. When purchasing the best toy for your 5-year-old girl, a few other things are worth considering. Consider your child’s interests: Most girls at this age start developing areas of interest, such as unicorns, princess toys or even just a color — often pink. Taking your child’s preferences into consideration when selecting a toy will increase the success rate of finding the right product. Pretend play: Girls love to roleplay and mimic parents. Pretend toys such as a cooking outfit or pony ride could be a big success. Girls can also analyze facial expressions better than boys and are likely to be fascinated by dolls they can nurture (source). Hands-on: They tend to be quieter than boys of the same age. Less boisterous outdoor toys might be preferred, such as a kite or streamers. When it comes to drawing or painting, however, girls are often ahead of the game (source). Spatial reasoning: Boys are generally thought to be better at analyzing sizes and distances than little girls (source). This is the reason why you won’t find as many building blocks, electronic or construction toys for girls. It’s however important not to stereotype toys and offer a variety. A Lego construction toy, showcasing your child’s favorite Disney movie, is almost guaranteed to appeal. We now understand the developmental milestones and a few things to keep in mind while shopping. Let’s have a close look at the best toys available for your little one. This American Girl doll might quickly become your little girl’s best friend. Cute animal faces are printed on her rainboots and T-shirt. Her long blond pigtails can be brushed and arranged to your little girl’s liking, and her limbs are movable. When she’s ready to go out, a bunny headband adds an extra touch. Willa has cute facial details, including freckles and hazel eyes. The T-shirt and skirt — along with the satin ribbon — can be easily put on and removed. If Willa feels lonely, this collection comes with four other doll friends. Ashlyn, Camille, Kendall, and Emerson can be purchased separately to extend the fun. Exciting pretend play awaits. Is your 5-year-old begging for a horse? This ride-on toy might be a good compromise. 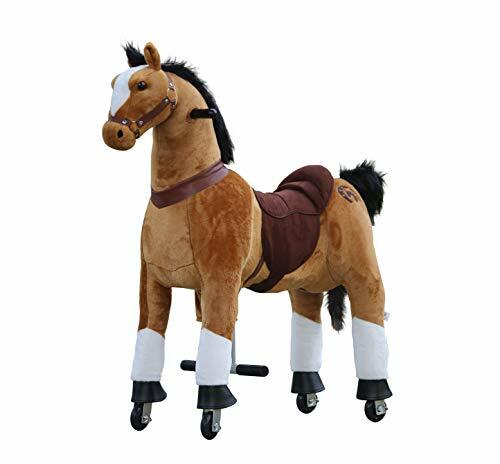 It’s been designed to look like a real horse for the most realistic experience and should stick with your child until their early tween years. Although the pretend horse cannot go backward, it’s able to make right or left turns. Safety locks can be used if you’d prefer your child to advance in a straight line. This toy can be used both indoors and outdoors — on a flat surface. Offering a chance for physical exercise and riding experience, your girl might need help initially with the mount. But over time, she should be able to mount independently. Most girls at this age love any type of accessory. Wearing them is fun but making them can take the excitement to another level. 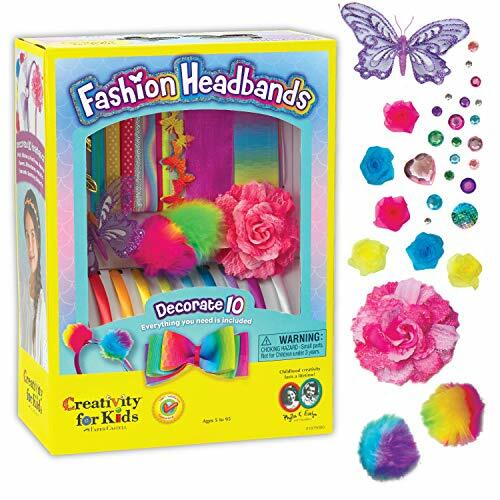 This award-winning headband kit includes 10 colorful headbands that your child can accessorize with satin, butterflies, flowers, feathers, and more. Promoting creativity and fine motor skills, little fingers will be working hard to come up with the most outstanding headbands. Ideal during a playdate, it might also help your little one with social skills, teaching them to share while promoting teamwork. Having trouble getting your child in the bathtub? 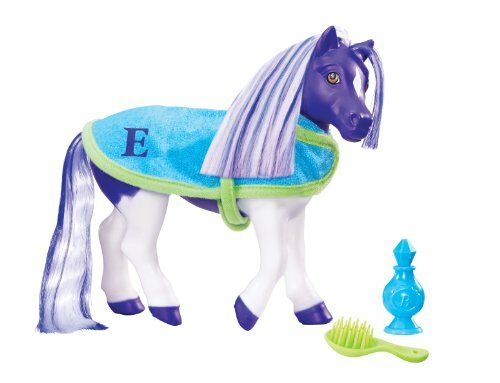 This pony toy should make any bath time battle a little easier to cope with. It could be the starting point for many interesting storytime adventures. When placed in warm water, spots on the body, along with the mane and tail, change color. From a purple pony, Ella the horse becomes pink. When bath time is over, this pony comes with a bathrobe, a pretend sprayer and a brush for grooming. Once dried, the pony converts back to its original purple color. 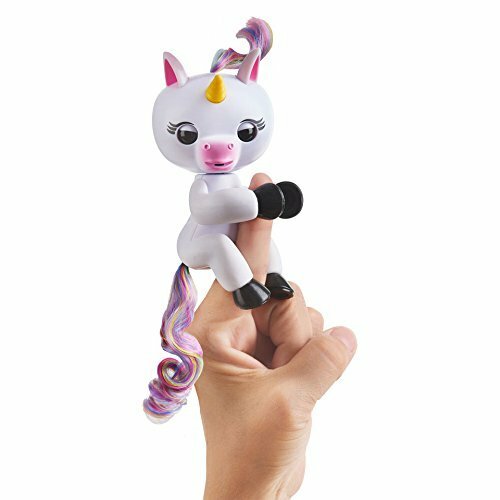 Gigi the unicorn comes in three different colors to appeal to all styles and tastes. She’ll latch onto your girl’s finger while making cute noises. Upside down or upright, Gigi will show different reactions. Blow a kiss and she might blink her eyes open or even respond with a kiss in return. Interactive, Gigi responds to touch, movement and noise. Batteries are included, so as not to delay the fun. This cute and popular set includes 10 Hatchimals and two “Swanlings.” Arranged in an egg carton, it’s easy to take on the go. 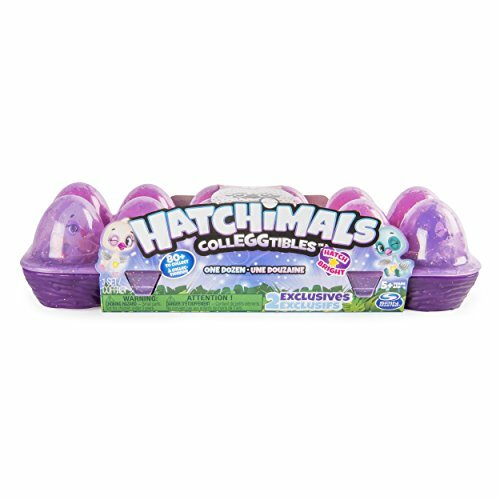 Whether you’re adding these Hatchimals to your existing collection, or this is your first set, your child won’t be disappointed. Each egg displays a purple heart. To hatch your Hatchimal, gently rub the heart. Once it turns pink, crack the egg to discover which Hatchimal it hides. These Hatchimals are either metallic or translucent. Some can also shine, glitter, or glow when placed over a light — light not included. Is your little girl already expressing an interest in fashion or drawing? This artistic kit should satisfy both interests. It includes 18 different stylish designs over nine plates and comes with four pencils. To get started, place the paper over the textured fashion plate and close the frame. By rubbing the black crayon horizontally over the plate, the design outline will clearly appear on the paper. Open the frame and it’s now time for coloring. 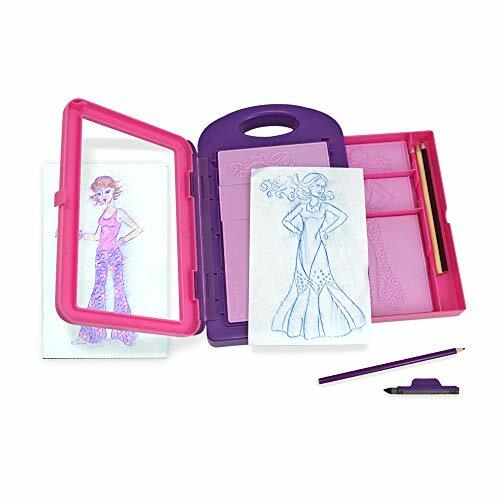 This fashion design art kit comes in a case for easy storage and transport. Note: the paper isn’t included. This pool kit should make your little girl feel more confident around water and add some fun to swimming time. 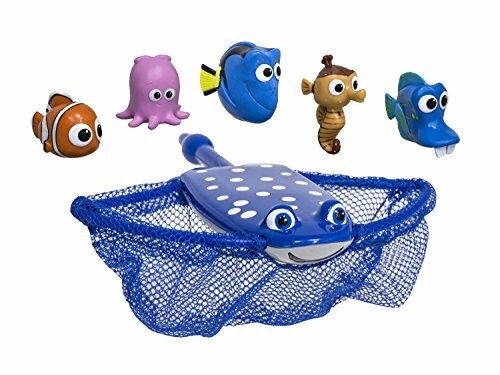 This Disney kit includes a net designed in the shape of Mr. Ray, plus five cute figures: Kathy, Nemo, Sheldon, Pearl, and Dory. Some characters float, while others sink for diving practice. Your girl might be more comfortable catching the floating characters at first. As she becomes more confident, the sinking figures can be used to increase the challenge. Do you need a little chef assistant? 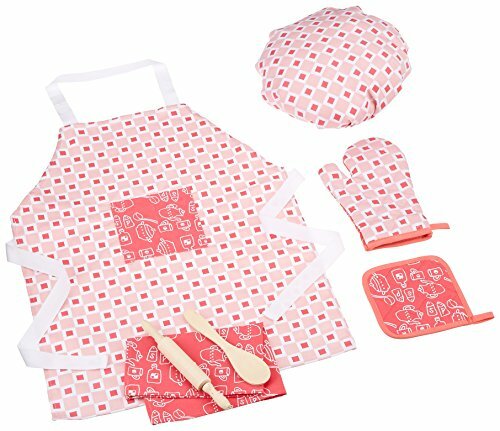 Or does your little girl own a pretend kitchen and needs the matching outfit? This stylish pink kitchen ensemble is a complete chef’s attire. It combines an adjustable apron, chef’s hat, two hot pads, a wooden rolling pin and cooking spoon. All the accessories are included to help out in the kitchen. The clothes are made with 100 percent cotton and are machine washable. Feeling like your child already has enough dolls, ponies, and princess toys? Looking for a different and more educational toy? This brain-building card set might fit the bill. Developed with the help of educators, the 120 cards are designed with fun and colorful illustrations. Each card includes an activity to challenge her skills in math, vocabulary, and more. When your child outgrows this card set, the Grade 1 version is available, to continue the learning process. 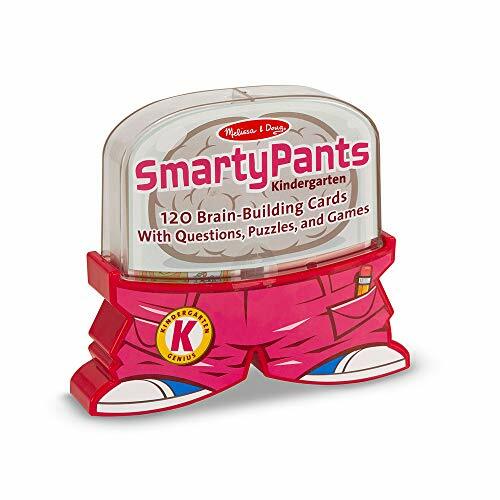 The set comes in a cleverly-designed tin featuring little baggy pants and sneakers, hence the “smarty pants” name. Containing a built-in handle and lock, this portable drawing case is easily transportable. It includes 10 color pencils and 16 reusable stencils, totaling 300 different shapes. A three-color pen has been added to the kit as a bonus. 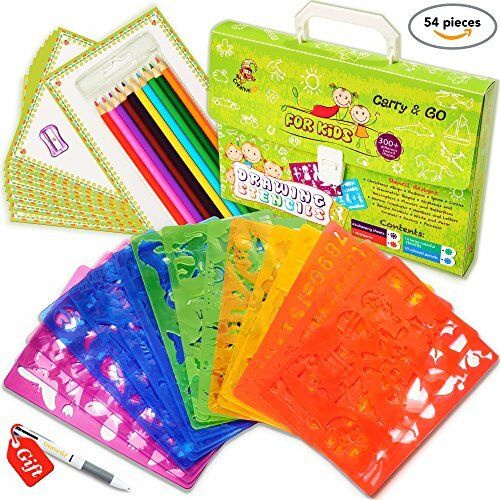 With animal, fashion, flower, butterfly or even princess shapes, this portable drawing case should keep your little one busy for a while. Shapes can be traced and then your girl can get to coloring. Once it gets too messy, stencils can be washed. The kit also comes with a sharpener and 25 sheets of paper. 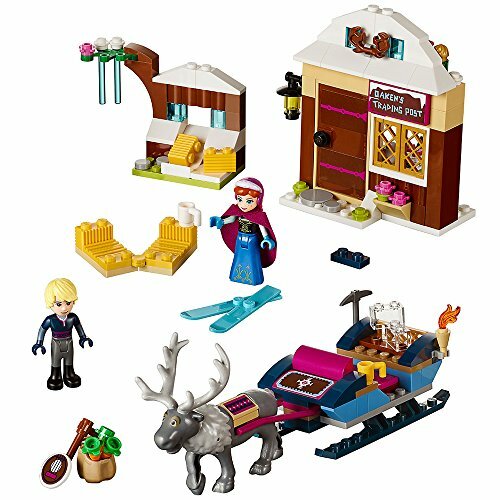 This Frozen set from Lego should “wow” most little girls. Including 174 pieces, it features the main Disney characters of the movie: Sven, Kristoff, and Anna. The sleigh can comfortably fit two passengers and includes accessories such as an ice pick, two ice cubes, cups, and more. A trading post comes with all the details to make the scene more realistic. This winter wonderland will be a great place for your girl to develop her imagination. If “Frozen” isn’t your child’s favorite, this 222 piece Lego set from the movie “The Little Mermaid,” might be a better option. 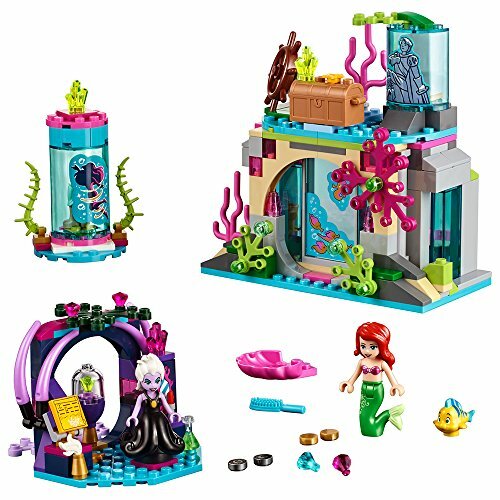 Ariel’s cave comes with a treasure chest containing a yellow diamond, a sliding door, and a hiding space for Flounder. To make sure she looks pretty, Ariel uses her hairbrush. Ursula makes an appearance, of course, so the evil witch might need to be monitored. Although your 5-year-old girl might need some assistance with construction, it should be the root of many exciting stories. Last but not least, Ariel has the option to go full-human, with legs instead of her tail. This toy should help your little one spend more time outdoors and enhance gross and fine motor skills. The colorful ribbon is attached to a handle and stretches to 78 inches long. By pulling the cord through the handle, loops will go from small to large spirals. The ribbon is made of sturdy material that should withstand hours of loops and resist rips. Although this is an outdoor toy, it could also be brought indoors if space allows. This cute, pink robot comes with 20 pieces. Your 5-year old girl might need a little assistance to snap the pieces together. 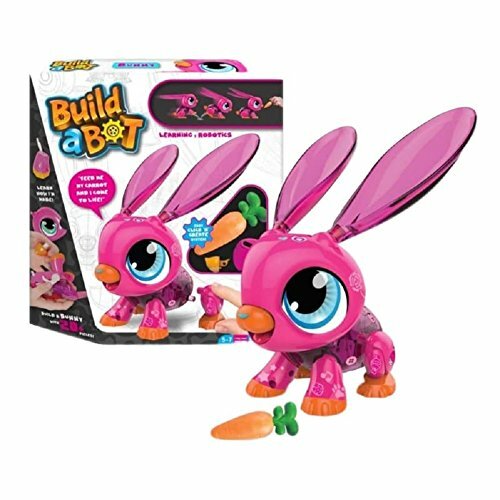 It includes a “Build-a-Bot” certificate as a reward when construction time is over, and instructions are included. Stickers allow your little one to choose her bot’s eye color. She can also decorate the bunny by adding stickers in the shapes of hearts, stars, and more. A carrot will activate the robot when placed on its nose. It doesn’t have to be difficult to select the best toy for your 5-year-old girl. Safe toys that stimulate her development, creativity, and interests are all widely available. Our selection of toys for this age should be a great start in your quest. 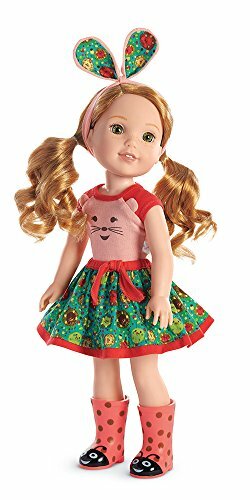 WellieWishers Willa doll would be the ideal doll for any little girl, in my eyes. I love the details and the simplicity of this doll. The fact that other dolls are available for purchase separately provides the opportunity for expansion and further play. What is your girl’s current interest? Which toy would you choose? We’d love to read your comments in the section below.